The Prophecies is a definitive anthology and scientific analysis of Edgar Cayces millennial prophecies about the opening of an ancient time vault in Egypt and a shift in the location of the poles which will create many catastrophic changes in the Earth in the period 2000-2001. Cayces predictions and stories are fully presented, for the first time ever, along with the major correlations in the geological record which corroborate Cayces stories, and prove that his predictions are on track, along with the major parallels between Cayces stories and the ancient memories of humanity as found in the ancient records, legends, and prophecies of various religions and cultures. The Prophecies concludes with a presentation of the discovery of major new scientific principles (Vortex Plate Tectonics) which explain how the Earths surface has been shaped by the mechanisms of continuous polar motion, migration, and periodical sudden avalanches of the crust to shift the pole into a new location. The Trilogy of the Return of the Phoenix concludes by using the principles of vortex tectonics to describe the most likely scenario of why, how, and when the crust of the Earth may avalanche during the period 2000-2001 to bring the North Pole close to Northern Europe, along with a summary of the likely consequences for humans. If there is a millennial prophecy, this is it. and I am joyful because of all that he has done. Behold, I am Thothermes, the skilled scribe whose hands are pure, the Lord of purity who drives away evil, who writes what is true, who detests falsehood, whose pen defends the Lord of All, master of laws who interprets writings and whose words have settled the Two Lands. Behold, I am Thothermes, Lord of Justice, who vindicates him whose voice is hushed. I am the protector of the poor man who has suffered loss of his property, who dispels darkness and clears away the storm. I come to you with my hands bearing Truth, and my heart has no lies in it. I place Truth before you, for I know that you live by it. These fragments were condensed and slightly altered from R.O. Faulkners translation of the "Book of the Dead", p. 184. They, along with the panel depicted on the front cover, are a part of Spell 183 of the Egyptian Book of the Dead in the rendition delineated in the "Hieroglyphic Funerary Papyrus of the Royal Scribe and Steward of King Sety I, Overseer of Royal Cattle and Scribe of Divine Offerings, Hunefer"; c. 1310 BC; British Museum Catalog 9901/2. FIRST EDITION: published in html version on CDROM during October, 1999. Copyright 1999-2005 by MW Mandeville; All rights reserved. Neither the author nor the publisher take any responsibility for the use of any of the materials, methods, or knowledge described in this book, nor for the products thereof. "The Prophecies" is a definitive anthology and scientific analysis of Edgar Cayces millennial prophecies about the opening of an ancient time vault in Egypt and a shift in the location of the poles which will create many catastrophic changes in the Earth in the period 2000-2001. Cayces predictions and stories are fully presented, for the first time ever, along with the major correlations in the geological record which corroborate Cayces stories, and prove that his predictions are on track, along with the major parallels between Cayces stories and the ancient memories of humanity as found in the ancient records, legends, and prophecies of various religions and cultures. "The Prophecies" concludes with a presentation of the discovery of major new scientific principles (Vortex Plate Tectonics) which explain how the Earths surface has been shaped by the mechanisms of continuous polar motion, migration, and periodical sudden avalanches of the crust to shift the pole into a new location. The Trilogy of the "Return of the Phoenix" concludes by using the principles of vortex tectonics to describe the most likely scenario of why, how, and when the crust of the Earth may avalanche during the period 2000-2001 to bring the North Pole close to Northern Europe, along with a summary of the likely consequences for humans. (Key topics include: 10,500 BC, 2000 AD, Ancient Civilizations, Ancient Egypt, Ancient History, Ancient Memory, Archeology, Atlantis, Catastrophism, Chandlers Wobble, Christianity, Crustal Motion, Earthquakes, Edgar Cayce, End Times, Geology, Geophysics, Giza, Great Pyramid, Hall of Initiation, Hapgood, Hermes and Hermetic Philosophy, History Of The 20th Century, Legends, Location of the Poles, Magnetic Reversals, Metaphysics, Millennium, Mythology, Mythology and Metaphor of the Phoenix, Orion, Plate Tectonics and Geophysics thereof, Polar Ice Caps, Polar Motion, Pole Shift, Prophecy, Prophets, Religion, Sphinx, Validation and Verification of Psychic Accuracy, Volcanism, Wisconsin Ice Age, and Y'shua. Edgar Cayce, who became world famous because of his remarkable psychic ability to find cures for disease and foresee the future, made 45 predictions during the height of his prophetic career about events which will surround a devastating shift in the poles of the Earth in the years 2000/2001. These prophecies are gravely troublesome, giving the impression of far-reaching, cataclysmic changes which will propel humanity into a completely unsuspected, unimaginable future. The Phoenix Quest began with two paramount issues: what is the "pole shift" proposition and what is its credibility? The effort to answer these two questions resulted in an anthology which is presented in these three volumes. It is the most comprehensive anthology and scientific analysis of the validity of Cayces work which has ever been compiled outside of his health prognostications. Based on five years of research, the Quest assigned an overall score of 92% for Cayces accuracy with long term predictions. With this objective score, the first which has ever been established for Cayce, the Trilogy provides a major historical milestone for Cayces legacy as well as for the scientific study of psychic/spiritual phenomenon. Book One, "The Veil", explores the credibility of the man, Edgar Cayce, by looking at his life and his documentation. His professional career is summarized and analyzed, and the general content of his readings is reviewed, including the metaphysical and religious context which provides the backdrop of his predictions. Books Two and Three provide the first comprehensive overview of Cayces prophetic scope. The books evaluate 253 world-class objective predictions given by Cayce and tie them together into a complete story of the past, present, and future. The setting and story behind the predictions, including their connection to the flow of Cayces life, are provided within an outline of the history of the 20th century, or within the history of the Earth and ancient times. The story line leaves little doubt why 191 of these predictions were objectively fulfilled, why 17 failed, and why 45 "destiny" prophecies are still pending for the millennial period of 1998-2001. Book Two, "The Great Break-Up", establishes the validity of Cayces predictions about human history and presents Cayces sweeping vision of the 20th century and beyond in a "Future History". Book Two summarizes the methods for verifying Cayces statements and provides a scoreboard for Cayces accuracy with various types of statements. 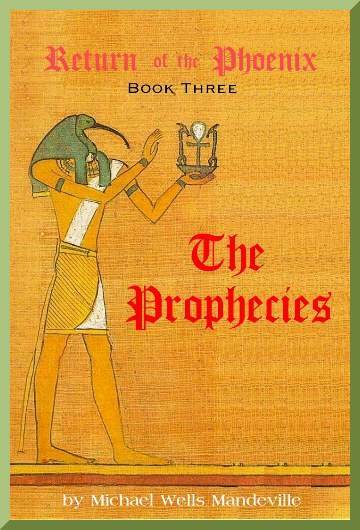 Book Three, "The Prophecies", establishes the scientific validity of Cayces statements about the ancient past and his predictions about all types of Earth events. Book Three concludes the Quest with an integration of all of Cayces outstanding predictions about the millennial era into a complete vision which describes why, when, and how the poles of the Earth will shift to a new location and how humanity can cope with the aftermath. The Phoenix Trilogy is a major scientific milestone for the study of spiritual/psychic phenomenon. The Quest used a scientific approach for deriving a "hard", empirically-based score for the credibility of objective psychic precognition and clairvoyant observations. The approach subjected Cayces psychic "data" to rigorous empirical critical analysis to substantiate Cayces credibility and areas of strength. With these scores, the Trilogy proves the existence of psychic or clairvoyant faculties and the ability of humans to consistently and reliably "tune into" both the future and the past. This approach squarely bridges the gap between science and the spiritual/psychic realm and it should be used for the study of any psychic. The Quest unfolds as the authors personal story of his long journey through the work of Edgar Cayce, ancient Egypt and other cultures, human history, and a large assortment of legends, myths, archeological findings, and scientific concepts about the Earth. The Quest begins with the authors encounter with the Cayce phenomenon and the 100,000 plus pages of Cayce transcripts, reports, and correspondence which reside on the Cayce/Davis CD. The Quest goes on to demonstrate the workings of the scientific approach which was used in the process of verifying Cayces personal credibility and the accuracy of this predictions. This first person approach provides guidance in how to study Cayces readings on the CD and is intended to demonstrate and convey serious science and philosophy in a manner which is understandable, continually useful, and interesting for large numbers of people. The Quest continues through the Trilogy to present and demonstrate how key ideas from Cayces readings merge to form an integrated vision which guides and leads to further discoveries. One such "find", another scientific milestone on the pages of the Trilogy, is the discovery of the mechanism which drives the motion of the plates in the Earths crust. From the attempt to correlate Cayces Earth change predictions with real phenomenon, certain correlations emerged which demonstrate exactly how and why plate tectonics works. Since this mechanism goes to the core of all of Cayces predictions and comments about the rapidly approaching pole shift, Book Three explains the mechanism in great detail with extensive proof. The crust of the Earth is formed and shaped by cyclical fluctuations in the wobbling motion of the pole (Chandlers wobble). These fluctuations in the wobbles of the pole are directly driven by the Sun and the Moon. All motion in the plates and blocks of the Earths crust are directly created by the combined tug of the Sun and Moon and these fluctuations in the wobble of the pole. This motion of the crust is experienced as Earthquake and volcanic activity and all of Earths major tectonic features (mountains, volcanoes, and continents) are directly created by these fundamental motions. The history of the Earths crust is essentially the history of the continuous motion of the pole through the cycles of its wobbles and the occasional sudden jerking relocation of the pole to a new point of equilibrium. Ironically, the mechanism behind plate tectonics is nothing but this shifting pole. The Trilogy concludes by weaving together many of Cayces key stories and ideas about Atlantis, ancient Egypt, and the millenium into the story of the "World Epic". For the first time, Cayces "whole proposition" is laid out in a comprehensive anthology of Cayces key ideas. The World Epic portrays the elements of a grand paradigm about the nature of the Earth, the history of humanity, and God. If Cayces propositions are true, many mysteries about the human situation. religion, spirituality, and many areas of speculative archeology about the ancient past can be resolved into clear and certain knowledge. Since Cayce is often misunderstood and is frequently quoted incorrectly and out of context, this mosaic of the World Epic will change the way even devoted fans currently understand and regard Cayce's work. The Quest continues in Book Three by finishing Cayces Future History through to the millennium and beyond. The full power of Cayces clairvoyance is fully unleashed in this final volume of the Trilogy. For the first time, every statement Cayce ever made about Earth events in the past or Earth changes in the future is presented, along with all of his other millennial predictions about the opening of the Hall of Records and the return of a Great Initiate. From these the visionary story which Cayces comments collectively tell emerges for the first time. Cayces predictions about Earth changes are thoroughly analyzed and compared with the latest scientific concepts and data to assess their validity and feasibility. All of Cayces objective comments about the past are also systematically explored. Based on the objective evidence, an accuracy of 90% is computed for Cayces comments about pole shifts, and an accuracy of 84% is computed as his average score for all Earth change predictions. Since many of Cayces Earth change predictions about the future are a part of his stories about Atlantis and ancient Egypt, the Quest forages broadly through archeology, ancient history, geology, geophysics, paleontology, and mythology seeking evidence and corroboration. Book Three demonstrates how Cayces stories and explanations parallel with evidence from many sciences and areas of knowledge. The Quest begins in Book Three by examining the pole shift concept and the lines of geological evidence related to it. Cayce described a succession of pole shifts which he claimed shaped the evolution of humanity and finally destroyed a civilization called Atlantis with a pole shift in 10,500 BC. Book Three presents a critical tour through the concepts of geology, plate tectonics and geophysics looking for the evidence of Cayces past pole shifts and for the mechanics of the Earth which make them feasible or impossible. The Quest discovers that the evidence which supports Cayces pole shift is abundant and directly confirms most of the dates which Cayce mentioned. Surprisingly, the Quest also discovers that many geologists and geophysicists are abandoning old ideas about ice ages and the slow movements of the Earths continents. Many Earth scientists are beginning to argue that not only are pole shifts feasible, only fairly frequent shifts in the location of the pole can explain the geological records of catastrophic floods, sudden climate and sea level changes, and other phenomenon. The Quest then undertakes to develop "tectonic" eyes by reviewing (for laymen) the basic concepts of geophysics and plate tectonics. Through these new eyes, the rest of Cayces comments about Earth changes and pole shifts are examined, beginning with Atlantis. From a high quality study which has been ignored in North America, the hard scientific data which describes part of the physical corpse of Atlantis is presented. Since the smoking gun of Atlantis demise was found near the corpse, Book Three presents the tectonic murder weapon as well. The Quest continues by looking for ancient memories which remember the last pole shift event in 10,500 BC. If Cayce and the catastrophe data are correct, there must be parallels in the earliest ancient memories of humanity which reflect the last event. Book Three presents the methods and results of a search for the ancient memories of floods and catastrophes in the ancient myths and legends of many cultures and peoples. Through a process of radical deconstruction, the ancient memory elements for many cultures were found and their parallels summarized. They parallel both each other and Cayce so closely the result cannot be coincidental. They describe in very similar ways the experience and results of a pole shift. Even more tellingly, from deep within the ancient memory comes what is most likely the exact specification of the sequence of the events connected with a pole shift and the length of the last one in 10,500 BC. Thus emboldened, the Quest subjects many ancient and traditional prophecies about "end times" to the same radical deconstruction to extract the common elements. "The Prophecies" presents the most common parallel between the old prophecies: they describe ancient memories of the last pole shift and they predict that the same thing will happen again. From the parallels between the ancient memories, old prophecies, and Cayces stories about the pole shifts which destroyed Atlantis, the Quest spots the tracks of the Phoenix. For the Egyptians, the story of the world is the Earth-Phoenix. Once in a great age the Earth-Phoenix flies, the ancient Egyptians told their children, and each time it flies the world is both destroyed and reborn. Myths in almost all cultures and prophecies echo and parallel this master metaphor in various ways, even closely agreeing on the number of former worlds. From this ancient Egyptian concept of the Phoenix, the Quest begins to outline the "World Epic". The World Epic begins with the cataclysmic history of Atlantis and other anti-deluvian civilizations. The story continues with the founding of Egypt, the building of the pyramids, and the sealing of the Hall of Records. The story jumps to Cayces stunning predictions about his own times and the last half of the twentieth century, and ends with Cayces Earth change and millennial prophecies. Each era in the World Epic is correlated with historical facts and the latest scientific findings. With the correlations of the World Epic serving as the backdrop, the Quest proceeds to analyze Cayces predictions about Earth events in the 20th century. Book Three organizes thematically all of his predictions for 1923 through to 1944 and analyzes them against the historical record to tightly assess the accuracy of Cayces ability. The record of verification in Book Three eliminates much confusion which has been created by an endless misquoting and misapplication of some of Cayces predictions. With well-developed tectonic eyes, the Quest finally tackles Cayces long range predictions about gradual "omen" changes in the Earth for the period 1958-1998. Cayce claimed that a shift in the equilibrium of the Earth in 1936 would cause a change in the location of the pole. This would begin a long term process of change. The trends of this change in the Earth would appear by 1958 and they would begin the process of the shifting of the pole. By 1998 these trends should intensify and then culminate in 2000/2001 with a sudden, major shift in the location of the pole. Book Three demonstrates the results of an exhaustive study of scientific databases which verifies these omen predictions. Many correlations of polar motion with trends in Earthquakes and volcanic activity demonstrate exactly how and why Cayces predictions have come true. The correlations show that Earthquake and volcanic activity have increased by a factor of three to four times since 1950 on a long steadily increasing curve. Since the early 1990s, this growth curve has rapidly climbed, showing a strong intensification of worldwide activity for 1998. This curve is completely anomalous and does not correspond with the flat line of average annual activity for the first 50 years of the 20th century. During the process of finding these correlations, the Quest discovers the direct evidence of exactly how and why all plate tectonics works, which can be expressed simply by calling it the Prime Axis Cycle. Ironically, it works like Cayce said it did. The gravity of the Sun and Moon constantly pull the crust of the Earth a little off center, creating a wobble in its spin. The cycles of the motions of the Earth, Sun, and Moon cause a 6.5 year cycle in the wobble of the spinning Earth and this causes all of the stress and motion which moves the continents and oceanic plates. This motion is turn causes most Earthquakes and volcanoes. Book Three presents charts of the Prime Axis Cycle which can be used to predict that Earthquake and volcanic activity will suddenly surge, from an already high level, during the last half of 1999 and the year 2000. Book Three completes the tectonic evidence by providing charts which show the history of changes in the Prime Axis Cycle during the past 100 years. These charts reveal that the spin axis of the Earth is showing clear mechanical signs of a periodic, jerky "hunting" for a new locus of stability. Just as solid rock is an illusion, so is the stability of the Earths pole. With this, the Quest completes its mission to assess Cayces personal credibility and the objective credibility of his predictions which began in Book One and Book Two. "The Prophecies" concludes Cayces work by integrating all of his pending predictions together into a seamless whole to summarize Cayces "whole proposition". The Earth changes are collectively presented as Cayces Change In The Earth Prophecy. These are then united with Cayces predictions about the Hall of Records and the return of The Great Initiate. As much as is feasible, Cayces own phrases and words are used to weave all of Cayces key ideas about the world and all of the elements of his pending predictions into one complete statement, the Millennial Prophecy. "The Prophecies" concludes by paralleling Cayces Change In the Earth prophecy with the concepts of plate tectonics. Cayces predictions are combined with basic geophysical notions and the behavior of past pole shifts to infer how Phoenix Five is likely to take wing, what it may be like to experience the flight, and some of the impact it may produce. the future belongs to those who have opened the mouth of the dead. whose refuge, patience, and final material support provided the sustenance with which this work was completed in the hills of Black Canyon. Thanks is due also to Phil Stevens for the computer gear I was able to use to do much of the initial work, to Bonnie Wood, Jon Jefferson, and Monroe Silver for their acute interest and the occasional contributions they made to help me along, and to Bari Hill and Dan Jacobs who helped buy me a printer to complete the final drafts and proofs. and to the USGS for its NEIC program and online computer databases. "Believe nothing, Oh monks, merely because you have been told it... or because it is traditional ,or because you yourselves have imagined it. Do not believe what your teacher tells you merely out of respect for the teacher. But whatsoever, after due examination and analysis, you find to be conducive to the good, the benefit, the welfare of all beings.- that doctrine believe and cling to, and take it as your guide." The Quest concluded that Cayces clairvoyance and precognition was abundantly evident in the testimonial evidence provided by his friends, admirers, and associates, and most especially in the generous gratitude and support given to his work long after his death by several dozen people who were quite obviously greatly benefited by Cayces readings. Since many of Cayces predictions about the 20th century and some of Cayces most important millennial predictions are directly connected with his spiritual and religious concepts, the Quest undertook to establish the metaphysical context of Cayces readings. Cayces entire life work, as contained on the Cayce/Davis CD, was outlined and the metaphysical and religious content of his readings was summarized. The religion in the readings was found to be essentially an early form of gnostic Christianity with strong parallels to Buddhist or Hindu yogin teachings. The basic concepts were found to be simplified egypto-hermetic ideas which closely parallel many vedic concepts about the material and spiritual dimensions of the cosmos. These concepts were interconnected with ideas about god realization and the development of psychic/spiritual faculties through a methodical science of meditation, diet, and various mantric arts. The Quest continued in Book Two by examining in great detail the predictions and comments which Cayce made about the 20th century. All of Cayces objective predictions about world-class economic and political events were rigorously analyzed to scientifically determine how much reliance can be placed on Cayces comments and predictions. Various types of long and short term predictions were verified and the findings were summarized into a scoreboard. Cayces long range clairvoyance and precognition was determined to be extraordinarily high with an overall accuracy of 92%. With this 92% score, the Quest assigned, for the first time in history, an objective scientific score to a major portion of a real psychics real life work. Most interestingly, the Quest discovered that the accuracy of Cayces clairvoyance and precognition was directly related to the time frame and the degree of impersonality of the event. The more impersonal the factors and the longer the time frame for the prediction, the more accurate it was likely to be. But the more personal the event or subject and the more short-range the prediction, where free will and ego factors could enter more actively, the less accurate Cayces predictions became. One of the Quests most interesting discoveries was that nearly all of Cayces predictions from hundreds of readings fit together very closely through pet phrases and key word choices to form a seamless unity. They were found to form a comprehensive "Future History" which outlined the main dynamics of the 20th century. The Future History foretold of the political and economic upheavals in the "Great Break-Up" of the dynastic age, described how the world would catch on fire (WW2) and advised about how to prepare for the advent of a "Great Leveling". The Future History went on to provide an accurate vision of the cold war era and correctly forecast the main sources of conflict in the world during the last half of the 20th century: the clash between religions, the clash between privilege and democracy, and the planetary conflict between capital and labor which politically polarized the world between the notions of free enterprise and socialism/communism. Stunningly, the Future History correctly foresaw that America would serve as the great balancer of international peace: as America leaned so would the world (and so, with the singular exception of Vietnam, it did). The Future History also foresaw the eventual collapse of communism in Russia and the turmoil of the Russian people while they struggled to rebuild a new society. Cayces Future History of the post war era failed only with China, and then perhaps only by degree and timing. Having established Cayces prophetic scope and accuracy in the Future History with over 200 economic and political predictions, the Quest was emboldened to continue in Book Three to establish the power and clarity of Cayces truly long term clairvoyance with Earth Changes. The primary focus of the Quest finally after three years  finally became the shifting of the poles, which Cayce often referred to as the change in the earth which must come again. The first task in Book Three is to finish the scientific mission to determine Cayces accuracy with his Earth Change and pole shift comments and assign him a hard score for this type of clairvoyance and precognition. The second task is to make a final estimate of the scientific credibility of the pole shift concept. From these an estimate can be derived of the probability of the fulfillment of Cayces prophecy of the change in the earth, which technically began in 1936 and will finally culminate in 2000/2001 with a radical shift in the location of the poles. Since many of Cayces Earth Change comments were directly connected to his stories about Atlantis, the founding of Egypt, and occasionally to scientific concepts about the nature of the Earth and the cosmos, the Quests horizons expand radically in Book Three to draw together the relevant facts and ideas from many fields and topics which prove or disprove Cayces comments. In these expanded horizons, the Quest presents several major new scientific correlations which were made in the course of verifying Cayces comments about the past. An outline and discussion is presented for a radical restructuring of the theory of plate tectonics based directly on the correlations of elementary geophysical facts with Cayces statements and predictions. Trendlines in various planetary databases directly prove that most crustal motion and tectonic change is directly driven by the constantly changing location of the pole in a 6.5 year cycle of Chandlers Wobble which "The Prophecies" has named the "Primary Axis Cycle". This phenomenon is named "vortex tectonics" to provide it a label for subsequent scientific discussion. Vortex tectonics can be used to accurately and easily the forecast of danger periods for earthquake and volcanic activity in various regions of the Earth, as the charts and tables in "The Prophecies" clearly demonstrate. Most surprisingly, the Quest discovered that the El Nino phenomenon is directly produced by the Primary Axis Cycle. As the Earth wobbles through the midpoints of its 6.5 year extremes in polar motion, the great rifts of the ocean bottom expand and contract, permitting greater lava and heat flow into the bottoms of the ocean. This heats the ocean water which produces the El Nino weather patterns. Doubtless, this is the most surprising finding of the Quest. The El Nino weather patterns are in fact a product of vortex tectonics, they are in fact an Earth Change within the meaning of Cayces predictions, and they do directly indicate and provide a measure of the rate of change in the earth. The record-breaking severity of the 1998/99 Nino/Nina oscillation in the weather directly fulfills Cayces prediction that the rate of change in the earth would be seen to have increased by the period 1998. Using the data which proves how earthquake and volcanic activity is directly driven and modulated by the motion of the poles, the Quest directly and unmistakably demonstrates an ominous phenomenon. There is a completely anomalous long-term trend of increase in volcanic and seismic activity. There is no doubt whatsoever that certain forms of this activity have increased by a factor of three to four times during the past fifty years in a long, steadily climbing trendline which shows no signs of plateauing. Thus, most unfortunately, clearly and decisively, without doubt, the Quest has proven that Cayce was correct about his long term prediction of an increase in Earth changes commencing after 1958 which would continue on through to the millennium. Consequently, there is very little reason to doubt Cayces prediction that a pole shift will follow them in the period 2000/2001. After an extensive scan and deconstruction of ancient myths and legends to extract just the "datum" of physical events, the Quest also determined that there is an "ancient memory" of the last major shift in the poles. Surprisingly, substantial detail still resides in this "ancient memory". When this detail is correlated with geological and geophysical data, there is enough aggregate detail to permit creating a composite "eye-witness" account of the length, magnitude, and phenomenon of the last shift in the poles, the one which most likely destroyed the antediluvian civilization (Atlantis) which left a legacy of rumors, myths, legends, symbols, and artifacts on nearly all continents. After the scientific agendas are served, the broadened horizons of geology, geophysics, mythology, ancient prophecy, and history provide the canvas on which the beginning of the World Epic is sketched and the remainder of Cayces Future History is composed as the Millennial Prophecy.